What a fantastic month this has been for Rocks By Rail. Some of our volunteers are just back from the South Wales Valleys where the Andrew Barclay locomotives were put through their paces at the Pontypool & Blaenavon Railways gala. It was great to meet and work with new people, it was also fantastic to see our locos against a different landscape steeped in industrial history. 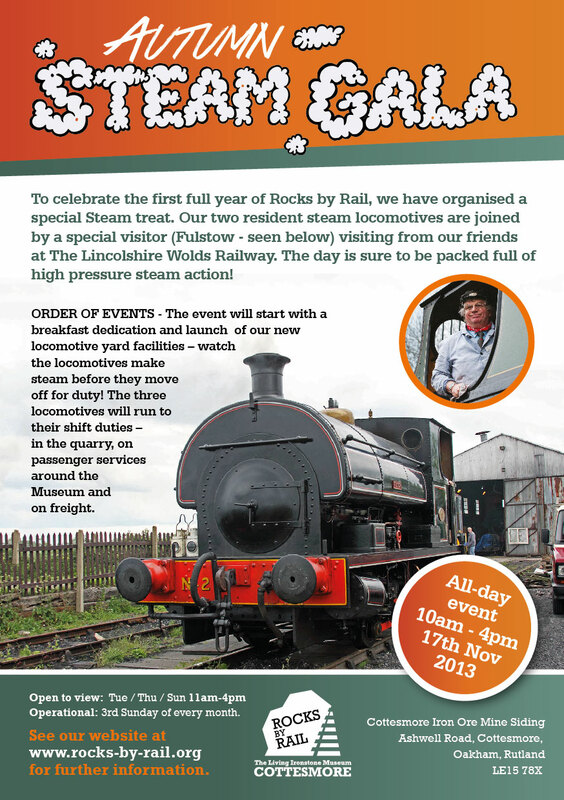 A good time was had by all, and Rocks By Rail looks forward to returning the hospitality shown by the P&BR volunteers. Some fantastic photos and footage are currently circulating the internet for all to enjoy. The next piece of news is a little closer to home. Rocks By Rail are very pleased to announce that we have been successful in our application for funding to create an Ironstone Railway Exhibition Centre at Cottesmore on the site of what is now the Loco Yard. This is a most significant gain for the museum – you can read the official press release here. 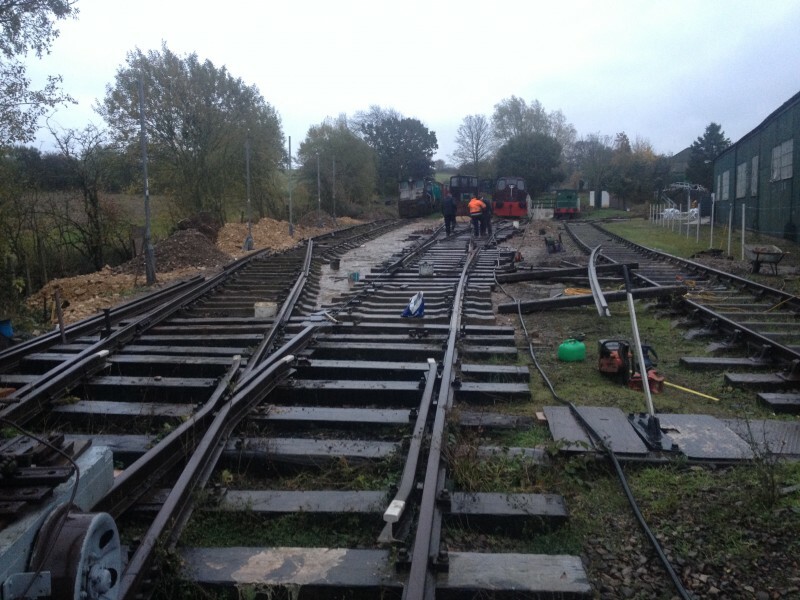 This project will see the existing three road loco yard re-laid and covered by an insulated three road exhibition and conservation building. Planning permission has been applied for, and we hope construction will begin very soon. And still to come this month is the Diggers & Dumpers event on Sunday the 21st. We hope you can come and join us! 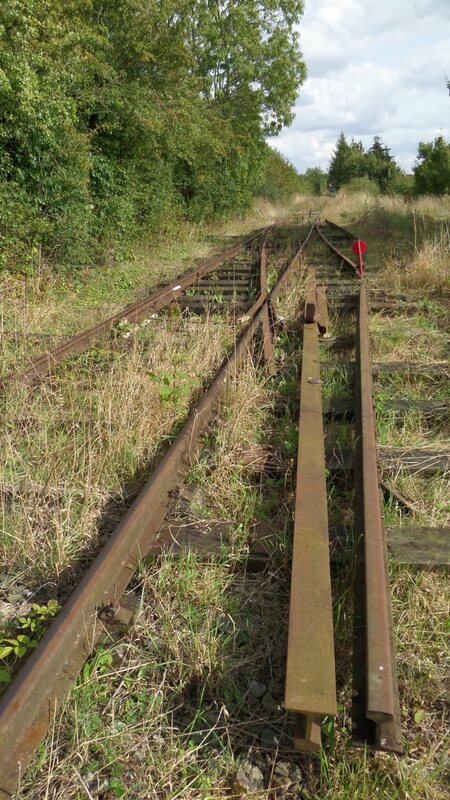 As August comes to a close, the ‘North End’ of the line has been cleared of the last remaining stock, and the remaining track is ready to be ripped up. This is significant news for several reasons. Firstly, we have a five year development plan (download here), originally written in May 2012, and this centres on redevelopment of the North End to create a set of exchange sidings with an accompanying platform so visitors can alight and watch shunting moves to prepare a train to go up to the quarry at the south end of the line. This project can not move forward until the existing track work is removed and the track bed and surrounding area cleared and profiled. Secondly, as the rail and sleepers are reclaimed from the North End, these will be fed into other projects currently awaiting donor materials – namely the quarry spur (which some of you may have noticed the ‘sighting boards’ for already in place), and also a project to see the current Eastern Headshunt made into a loop, and the head shunt extended along its current course. Thirdly, it means that some very interesting pieces of stock will now be out and back on display – including our skip wagons and our dump car rake. There is plenty to keep our volunteers busy over the next three years! We think you will agree that a quarry spur, an Eastern Loop, and the whole North End development will add significantly to our goal of providing as full an experience as possible of a quarry railway and associated exchange sidings in the 1950s and 60s. We are also sure that you will be pleased to hear that the developments will mean the length of line over which we can run passengers will be extended. While this is all good and positive news, don’t forget that we run thanks to a team staffed exclusively by volunteers, if YOU would like to be part of this friendly team, please visit our contact page and get in touch. 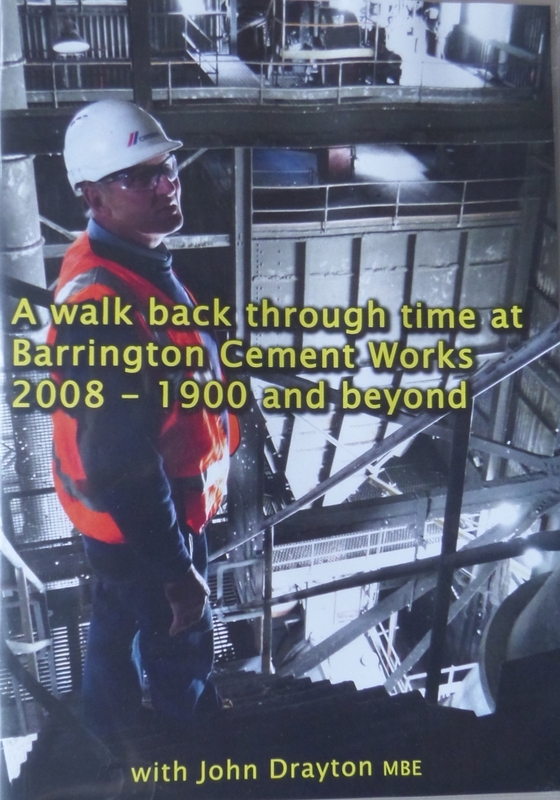 As many of our visitors will know, Barrington Cement Works and Rocks By Rail have strong ties, hence the museum is proud to house two Thomas Hill locomotives and several wagons which once worked at the Cambridgeshire plant. Many of you will have noticed that one of the Thomas Hill locomotives is named ‘Mr.D’, and can often be seen on running days working our quarry section – Fitting really as this loco worked the last quarry train in the UK, and bears a plaque to commemorate this. Well, the real life Mr.D, that’s Mr John Drayton MBE, has now produced a DVD chronicling the development of the works and how the quarry and the railway that served it operated. Throughout the DVD the viewer is treated to many interesting and amusing anecdotes from Johns career which spanned 44years! The DVD includes talks on the geology of the site, and the archaeological remains found in the workings. There is lots of railway footage, both steam and diesel – and indeed features locomotives provided by Rocks By Rail, which can be seen working alongside the electrically operated drag line and face shovel. Also featured are the plants washmills, the kiln, the control room, and silos. This is a story that really only this one man can tell, and tell it he does, in his own style. 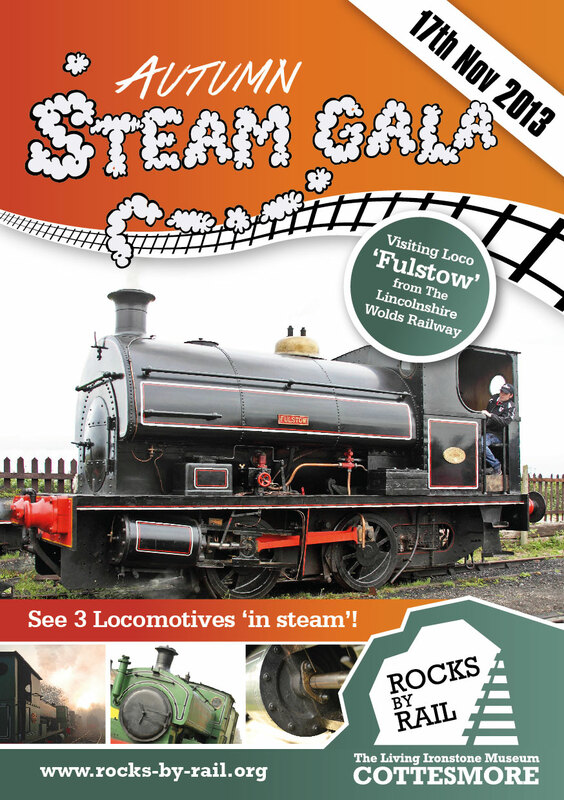 Rocks By Rail is pleased to offer this DVD for sale at £9.99 – available through our Sundew Café, or contact us through one of the means on the contact page of this website. 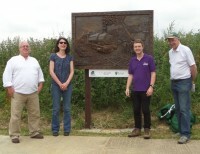 We have just finished clearing away after our Sundew event commemorating the fortieth anniversary of ‘The Great Walk’. We were please to see so many visitors, both new and returning. The volunteer team worked hard to keep up with demand, and everyone had a great day. The Sundew cab project has generated a lot of interest among visitors and local media – today even saw an ‘almost live’ outside broadcast with Rutland Radio presenter Rob Persani in attendance. This has to be a first for us – Hopefully not the last! We would once again like to thank people who responded to our appeals for Sundew photographs and stories in the local media. Our volunteers spent a lot of the day collecting contact information in order to be able to get back to people later on in order to record these great stories and anecdotes and preserve them for the benefit of future generations. One of the highlights of the day was of course the long awaited unveiling of our new piece of industrial art commissioned by Rutland County Council, and funded with Arts Council Renaissance funding. This fantastic plaque will great visitors and hopefully encapsulate the experience they are about to have as they pass through our gates. Never ones to rest on our laurels, we will be hard at it preparing for the next event very soon! It is with great regret and sadness that we must report the passing of Simon Layfield our General Manager, close friend and visionary of Rocks by Rail. Simon Passed away on the 2nd February 2014 at the age of 49 .A service was held in his memory at Knebworth Crematorium which was very well attended by members of his family and friends both from Rocks by Rail and Simon’s other passion of cycling. Simon had a vision of Rocks by Rail which inspired him and the small dedicated group of volunteers who have shaped the site in to the only museum representing and conserving the Ironstone Quarry Heritage of the East Midlands, a living museum where the entire process of iron ore excavation and its impact on the landscape and social history can be developed and explored. We appreciate everybody’s understanding at this time as we are all deeply saddened by Simons loss so suddenly, our aim is to continue his efforts at Rocks by Rail and see the Development plan Simon worked so hard to create along with the volunteer team come to fruition, Simons energy and enthusiasm for all things Ironstone has inspired many and continues to spread, we look forward to seeing all our visitors and supports soon and sharing that enthusiasm with you. The gala was a close run thing – we completed the construction of the trackwork in the locomotive yard leading to the new servicing pit at lunch time on Friday 15th November after rebuilding the pointwork, donated from Barrington Cement Works and barely dismantled a matter of three weeks before, as well as essential jacking and packing to ensure that there were no gaping voids under the track. All three locomotives were in attendance, Peckett 1749 FULSTOW visiting from the Lincolnshire Wolds Railway, Andrew Barclay 2088 SIR THOMAS ROYDEN returning from a season at the Royal Deeside Railway and resident Andrew Barclay 1931 by the end of the week after transport arrangements had gone smoothly. The locomotives were carefully prepared for their long weekend of work while the final shunting took place, FULSTOW joining the diesel fleet of JEAN and Mr D in completing the work on Saturday. Sunday saw a fantastic turnout of visiting enthusiasts from far and wide, some returning friends but a large number of keen visitors who had not been to the Museum before. 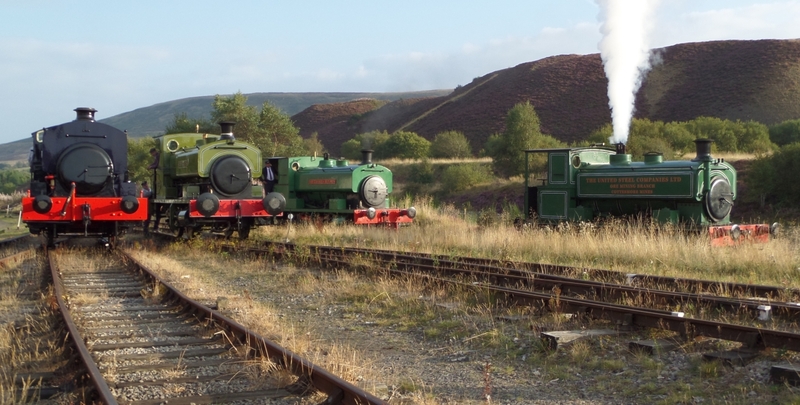 They were not disappointed for action as the three steam locomotives took ‘shifts’ on each type of activity – working the quarry, hauling the hopper train up our ‘bank’ into the yard and then shunting stock while the third took charge of our passenger shuttle to the far end of the Museum site. The volunteers were complemented on the development progress at the site since the beginning of the year – the first steam gala being a great showcase for the hard work. On Monday, we hosted the second photographic charter organised and promoted by Russ Hillier when around 50 keen photographers arranged a series of photographic opportunities with the three steam locomotives. These included a period of double heading, solo working, a cameo quarry scene and the day culminating in an evening shoot just as the light was fading. The event saw all types of weather including sun, fog, rain and a magnificent sunset – all made for some very photogenic scenes! The organiser was extremely pleased to receive a phone call for a late entry of classic plant for the Diggers & Dumpers event on Sunday, when local owner of a TRACK MARSHALL blade dozer offered the operational machine for the event. Of even greater significance than having an operational bulldozer to level the ‘Digger Playpen’, was the information that the machine, which was preserved in 1970, was delivered new to Stewarts & Lloyds (Minerals) Limited and worked on restoration of ironstone quarries across the ironstone belt of the East Midlands. The event is shaping up to see the most intensive use of our quarry and playpen areas to date, with action focussing on the Ruston 22-RB dragline loading the vintage Euclid B5 dumptruck, supplying material for the dozer to spread across the work area. The quarry area will see steam haulage from the quarry face as the Ruston face shovel swings into action. Visiting machinery of a more modern era includes a SMALLEY excavator, built locally, this is an example which has worked in the Rutland, Lincolnshire and Northamptonshire areas for the whole of its life. A reminder that as part of the event to celebrate our first year of opening, we have organised a ‘Rutland Record’ attempt to gather as many diggers and dumpers into our quarry as is possible. Children (of all ages) are invited to take part in the challenge by bringing their own toy quarry diggers to pose in the quarry area, the official count taking place at 3pm.